Your site is invaluable and I'm so relieved I've found it. The development of cult-like behaviour and practices in AA is deeply concerning and I've seen the effects on vulnerable newcomer members first hand. 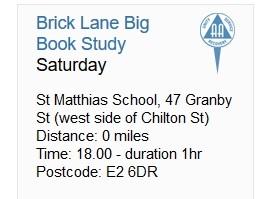 I have a new meeting for your list, it's the 6pm Brick Lane Big Book Study Saturday meeting, in London. The sponsorship and ideology that happens there is fundamentally cult, not AA. Newcomers are asked to find their part in things such as childhood abuse or domestic violence, told to cut off from old friends and family completely, mandated to attend certain meetings and if they don't, they're dumped as sponsees, and mandated to street step very early in the morning. They are made to work from a computer on worksheets and if they don't have Internet access or word processing programs they're told they don't want recovery enough. They're told to come off all their medications, and if seeking work, they have to run the jobs they're applying for past their sponsors first, as well as all other life changes. They have to check in with their sponsors multiple times a day, which again for destitute newcomers is impossible, as that requires phone credit. They're discouraged from attending meetings viewed as not strict enough or not carrying the AA message (in other words, all meetings apart from their meetings). They are silenced from sharing about depression or suicidal thinking as it is viewed as 'carrying the mess, not the message'. The people who have talked to me and other concerned members have found it incredibly hard to disclose, as the gaslighting and guilt tripping that goes on is deep and pervasive, such as being told they'll make people ill, destroy AA due to self will run riot, deny recovery to newcomers, and/or relapse and die, etc. Most members in East London who have been around long enough are aware of the practices in this group, and they even have a nickname. We suggest alternatives that occur at the same time, if newcomers express an interest in attending this meeting. Luckily, in London, we have 700+ meetings a week to choose from, but I feel extremely sad for members in other parts of the country who don't have as much of a choice, and just need a meeting. This group frequents and run the service board for at least another two meetings in the East London area, and recruit from there too. I have only been to one of those meetings, in my early days, and I do not remember the message carried, but I do remember being denied a service position - it has since become clear that they fill service positions in their cult groups from within their sponsorship structure, and I already had a sponsor, therefore was more than likely viewed as not being one of the group (which I am now very grateful for). I have attended the Brick Lane one several times, however, and it seems evident that this is the mothership meeting for their practices. I hope this meeting can go onto your list. I am happy to send the other two meetings as well if you think this is appropriate. Comment: The above pretty much summarises the activities of cult groups in AA. They come in a number of shapes and sizes ranging from the local 'guru' (usually self appointed) who's set up shop peddling his/her profound (?) insights into the AA programme based more often than not on an entirely idiosyncratic, overly literalistic, highly selective (cf. Tom and Jerry's …. sorry …. Joe and Charlie's daft series of lectures on the subject .. whatever did happen to Chapter 8 Working with Others ???) reading of the tome …. to complete franchise operations like the Road to Recovery, Primary Purpose and not forgetting of course (who could) Back to Basics (which is a nice little earner for its chief proponent Wally P) These aberrations are usually personality driven (see Tradition 12) propped up by an abusive 'sponsorship' hierarchy and entirely fear based. Should a new 'prospect' fail to comply with their new 'sponsor's' “suggestions” (?) the ultimate sanction is invoked ie. you'll drink again!! This is usually sufficient to bring them back 'into line'. Of course there's nothing mysterious at all about how AA works. Belief in any kind of divinity is entirely optional. The fundamental driving force behind AA is quite simply the fellowship, and the most evident example of AA's efficacy is the fact that people not only get sober but REMAIN sober for their entire lifetimes. This is an empirical and undeniable fact. The real power behind AA is the power of EXAMPLE... and preferably good example. Stick around people who stay drink free and who conduct themselves in a reasonably civilised fashion (ie. don't spend their time throwing their weight around and lecturing everyone in sight) and the chances are pretty good that you'll stay off the sauce as well. It really is that simple. How you practice the program or even which version you adopt is pretty much irrelevant. Being able to recite bits out of the Big Book really impresses nobody. It's a nice party trick perhaps but slightly boring after a while. Just put the drink down and get on with your life the best you can.. that's it! I'm an NA member in the Devon Fellowship. I just read your article about NA and DAA in Plymouth and thought you might value an update. As your article accurately states, up until about 9 years ago 'Roads to Recovery' AA was trying to infiltrate NA with the same agenda and tactics of aggressive recruitment and controlling sponsorship they still use in AA. They set up NA groups titled 'Into Action' (chapter from AA's Big Book), and no one was allowed to sponsor using NA literature, and everyone had to be part of the same sponsorship chain that was rooted in Roads to Recovery in Plymouth. As you might imagine, this caused huge disunity in NA in what I assume is a similar way to what AA is still experiencing, and also caused a lot of harm to the reputation of NA in all the services that engage it. Fortunately, In 2009, these groups finally accepted that the Devon NA fellowship was never going to accept their processes, and they shut down their 'rogue meetings', and immediately reopened them as 'DAA' meetings. They continued to be being sponsored in chains rooted in the Roads to Recovery AA group, and continued to aggressively recruit sponsees. NA members never attend their meetings so they have enjoyed unity in their own culture, though strangely, with regular splits where groups form factions. Over the last few years, NA in Devon has been free from these people and has grown much stronger. Its meetings have trebled in size and healthy, gentle, non-controlling sponsorship chains have flourished. Devon NA's service structure has become very strong and enjoys a peaceful and loving group conscience, strongly committed to NA's spiritual principles, and a unity in service that seemed impossible a few years ago. The DAA meetings split into two factions, and more recently some of their members have left and started a CA group. NA has recently had some DAA members again seeking to promote their fellowship by recruiting newcomers from NA, but NA quickly put a stop to this. NA has written clarity statements and developed practices that make very clear that whilst NA respects that there are many pathways to recovery, its meetings exist only for those people wishing to recover through its processes. 1. Are you here to receive the Narcotics Anonymous message of recovery for application in your own recovery process? 2. Are you here to share the experience, strength and hope you've gained through NA meetings, NA sponsorship, and NA literature? This makes no judgment of them and honours the 3rd Tradition, but also leaves them having to make a choice about facing their own motives and communicating honesty. It's never failed yet. They either leave immediately or don't return. Just to be 100% clear; If any one of these people wanted my help, I would very willingly be there for them. My experience is that they never attend seeking help for themselves. They only attend seeking recruits. Local drug services are now pretty much up to speed on these dynamics. I'm not so sure about probation etc. I speculate that there are some very distorted religious beliefs behind these people's 'fundamentalist' behaviour that actually stem from the same religion I am part of, just, from my perspective, from a completely deluded misinterpretation of what the text of this religion names. What ever my religious beliefs, I trust in NA's group conscience and am coming up to 19 years complete abstinence clean time thanks to NA's literature and culture of recovery, and am still very grateful for this. Comment: The description above mirrors fairly accurately what is happening in AA in those parts of the country contaminated by the Road to Recovery 'strong sponsorship' ethos (ie. bullying). The fellowship has factionalised splitting between what we would term real AA and its sick counterpart – the cult. It's a pity that AA seems less able to deal with this phenomenon than its sister fellowship. Maybe there are lessons to be learnt here. But on past performance it seems unlikely that any effective action will be taken and this process will continue accelerating the already established decline of AA until yet another 'temperance' group is consigned to the dustbin of history. For a fellowship that places such emphasis on the value of experience we seem to be quite unwilling to learn from either our past or our mistakes! The Traditions exist neither by accident nor as a mere afterthought. They are crucial for our survival. The cult may be entirely ready to pervert their meaning but we simply cannot afford that luxury. In the past I have provided you with information on the impact of "Sobriety Courts" and their slavish addiction to the requirement that probationers return to court with signed court slips to "prove" they have attended AA. This practice has absolutely no basis in the methods of the Big Book and breaks at least 6 Traditions. It has resulted in near constant problems in Unity, Singleness of Purpose, anonymity, sanctity of a Closed Meeting and definition of a member of AA. --Existing members had no reasonable promise that their anonymity would not be broken. --Groups and meetings were folding. --Private invite meetings were being formed to avoid the above reference problems. --The method of coercing probationers was in direct contradiction to the methods presented in the Big Book. Therefore, many were actually having their potential recovery delayed or prevented by the practices. --The majority of Probationers were not alcoholic and therefore did not need the service provided in an AA meeting. --Having many attendees without a need or a desire for sobriety had, over time, changed the culture of AA. --After 3 decades of the Courts sending in excess of 100,000 probationers per year to AA in North America the overall census of AA remains stagnant in that same geographic area. This would seem to confirm that few actual recoveries were being created by the process. Certainly not at the levels claimed by the courts and some AA members. --AA members have misused the autonomy clause of the 4th Tradition to justify Affiliation with an outside entity, while this was done with the best of intentions it has been incredibly damaging none the less. The purpose of the submission was to get the issue addressed at the next Conference (end of April 2018). NY GSO saw great merit in the findings we presented. They agree it is a complex situation that will require thoughtful consideration prior to presentation at the Conference. To accomplish that they formed a sub Committee to study and make recommendations. We are hopeful that they will follow through on their commitment and that real support for righting the ship will be provided. Such support could come in the form of "Conference Recommendation" or a complete over haul of the existing Guideline on Cooperation with the Courts. That Guideline was created in the mid sixties and has never had a major edit in spite of the monumental changes to "Sobriety Courts" across the land. As always I provide this information to assist my brothers and sisters in addressing similar problems in real time. If you allow these changes to occur in your groups and wait until the problems manifest themselves; you will have a devil of time putting the toothpaste back in the tube. Comment: It's really quite amazing how much trouble can be caused by those AA 'promoters' (ie. the ego driven) whose activities are accelerating AA along a path to terminal decline. No doubt at the latter stages (when it's too late) they will raise the defence of 'good intentions' a well-known ploy of the stupid and irresponsible, and of those who have never really troubled themselves with AA tradition. You have been warned! PS Thanks to our correspondent. Keep up the good work! ...... this group discuss, for example, that there is no need for a sponsor as it is not in the Big Book. All this of course occurred outside of an AA setting. Nevertheless I relayed my concerns, and those of the other men, to the all (apart from me) female committee. In the last week, things have progressed to the point that Back to Basics are now using the same room that AA have their meetings in to host post meeting group sessions. My phone calls to GSO confirm that Back to Basics is not endorsed by AA. B2B has crossed the line and is becoming increasingly clear that men are no longer returning to Surrey st meetings as they feel B2B is not 'in the spirit of AA'. If this were an episode of Ramsay's Kitchen Nightmares, the above phrase would be ringing in your ears - and there is no more appropriate phrase to describe- what is left - of Plymouth Intergroup. 85% of all positions remain vacant, 10% of those in position are 'Caretaking' the role until someone takes over (12th of Never, should you ask) which leaves 5% elected and in position Treasurer and Where To Find (absent from more meetings than he has attended). The R-T-R contingent have all stepped out of their positions, and have done this early - having achieved nothing in their time in position. And their excuses boarder on hilarious - I've got a baby now (hmmm.....this is an hour and a half meeting once every two months, not a full time 40hr per week position) - I thought I needed to rotate out at this time - oh well, I've missed the last meeting so I'll just step down now - are amongst the best and most recent. R-T-R love love love taking up service positions at Intergroup, and drop them before they are due to rotate out - it's a form of control, I'm sure. The number of GSR's represented at Intergroup coup now be counted on one hand, and would still give you fingers left over. It has become an established fact that Plymouth Intergroup is a waste of time. Now, shall we look at who's left? The Treasurer - the ultimate control freak. The most recent meeting was moved to accommodate her being there. Heaven forbid that she may not be able to attend, hence we were given days of notice that the meeting was moved, and this lead to an all time low attendance. Now, GSO have told groups that they may keep a reserve of money to use for local work, PI etc - this was discussed some 6 months ago, and Plymouth Intergroup decided to hold back a portion of money to use. You will see how this links in to the start of this letter, as there is no one in position to do any additional work! So Plymouth, the Intergroup that haemorrhaged money whilst the previous Treasurer, a R-T-R member, gambled the lot away! So an Intergroup that cannot be trusted to manage its finances is allowed to keep a higher surplus and not send it to GSO!!! Plymouth Intergroup is, unfortunately, a non-functioning body. Nobody is allowed to join and everybody leaves...it provides a platform for AA members to be seen to be doing 'service' - service being sitting down in a room for barely 90 minutes, 30 of those spent trying to avoid the halitosis of the R-T-R GSR, who ALWAYS has to find a point from the previous meetings minutes, no matter how small, to go over - several times. Given the choice I feel that he would pull apart the grammar, spelling, syntax and type font used - as long as it showed that he was doing service. So we concluded our update - a rotten non-functioning Intergroup, that does nothing to spread the message, nothing to enable members to take part and nothing to send the correct sums of money to GSO (you never know, someone, one day, might, just might use some money to spread the message - but then again. No.) But we will see what happens at the next meeting, once the Treasurer has decided a date convenient for herself. Comment: In reading this piece we are inevitably reminded of the Dead Parrot sketch c/o Monty Python. … and the proper response (suggested) to any cult member who offers to sponsor you! 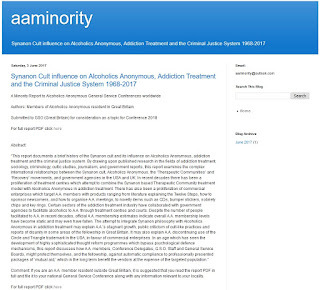 A new website (aaminority) has been set up devoted to publicising the AA Minority Report. All relevant links on our site now point you in that direction. We recommend that any and all AA members concerned about the future of our fellowship (and its increasingly parlous state) study the report and reflect on its implications for the future … and then hopefully take the necessary ACTION! They go on to mention the “control and strange daily rituals” prevalent in these groups (Miles Street and the Ashmole meeting) together with the “daily torrent of phone calls starting early am and going on till late … as they [newcomers] ticked off their duty to call 2 newcomers a day. It felt like harassment and I stopped going to AA”. Fortunately our correspondent reports that they subsequently discovered REAL AA, found a “sensible sponsor” with some REAL experience of REAL recovery and now participates in “very happy NORMAL [our emphasis] step based recovery”. aacultwatch has been set up by members of Alcoholics Anonymous who are concerned about the development of a movement within the Fellowship that we refer to as a cult. It is our view that this cult has as its aims the control of AA in Great Britain and the promulgation of its own version of the recovery programme that is both a corruption of the message and the spirit of the Fellowship. Our aim is to raise awareness of this threat and encourage members to act according to their conscience to marginalize this movement. Local members are in the best position to judge what should be done in their area but already some experience has been gained in the Fellowship on how to respond to this malign influence, and some of these ideas are also presented on the blog.